Mekatron services and repairs Toyota, Honda, Nissan, Mazda, Subaru, Acura, Lexus, Infiniti, Mitsubishi, Isuzu, Hyundai, Kia, Scion, Suzuki, Audi and Volkswagen. Trouble with your Toyota? An issue with your Infiniti? Mekatron diagnostics are key. Scan tool. We have four, including factory original equipment for the majority of the cars we service. Engine analyzer. We have three, including the latest for DIS and coil over ignition. Lab scope. We have five, including one that can look for intermittent glitches 1.6 million times per second (for those unusual intermittent problems). Break out box. 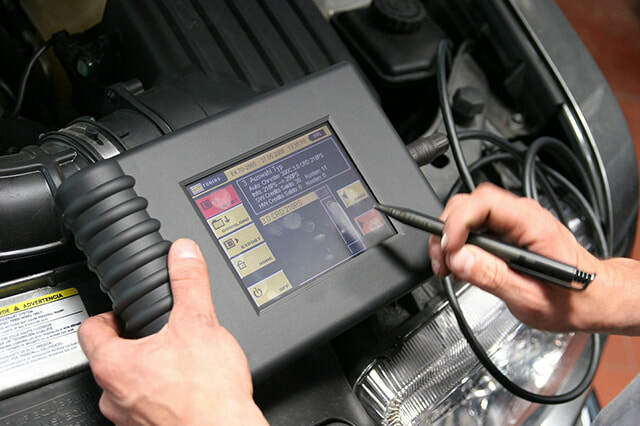 We go one stage further and have Simu-tech, an advanced diagnostic analyzer that connects to 60+ wires at the main car computer. It automatically checks the resistance of every sensor and actuator, puts high current down each wire to look for bad grounds or dirty connections, and can check the real time operation of every computer-controlled component and sensor multiple times in minutes. We have the automatic interconnect cables for almost all Japanese cars. Graphing voltmeters. We have two. Computerized four wheel alignment system. We have a very accurate Hunter system. Computerized wheel balancer. We have one. Brake lathe. We have two -- one for on the car and one for off vehicle. All the latest lube equipment, as well as racks and power and flushing tools. Hazardous waste clean up and disposal equipment. All data computerized technical service bulletins and repair manuals. Mitchell on Demand computerized service bulletins and repair manuals. Identifix technical service fixes and hotline. IATN technical service fixes and chat line info. All the original car manufacturers’ technical data websites. Technical hotlines from our major parts suppliers. Our own in-house database of fixes cars, created over 20 years. We can instantly access this information while writing symptoms on repair orders. All of the above information is provided to our staff via DSL lines and the latest computer network available. All our staff attend regular training classes for the latest diagnostic information on new cars and the latest diagnostic techniques. Many are factory specific for each make of car we service, while others cover the uses of the latest equipment we have. (See above.) Some courses have required that we attend twice a week for almost an entire year. Credible articles written in our industry indicate that the technician of the future will have to attend as many educational classes throughout his career as a medical doctor. Our service advisors attend the very same classes as the technicians to obtain the latest information on new car models, as well as management, sales and communication seminars. These help us to better explain the complexities of the modern automobile to the layperson. We take particular pride in our ability to relate this information to you. Mekatron&apos;s experience and integrity simply outshine the competition. We invite you to experience hassle-free car repair.